The Canadian dollar hit a new 3½-year high Wednesday and North American markets staged their biggest one-day rally of the year. The Canadian dollar hit a 3½-year high Wednesday and North American markets staged their biggest one-day rally of the year. Gold reached another record close as the U.S. greenback weakened. 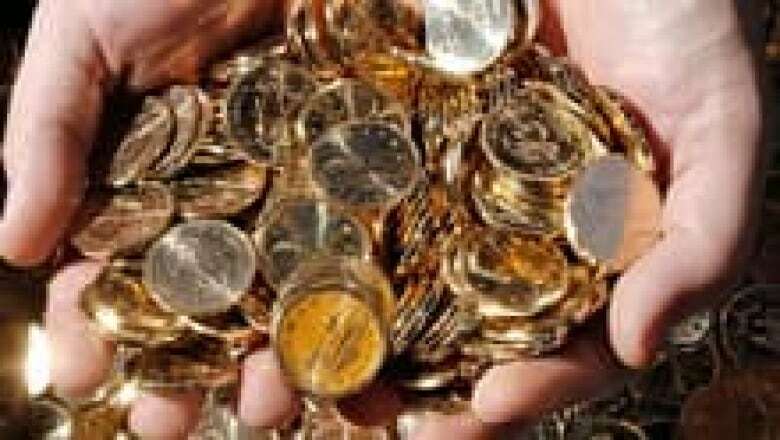 The loonie closed up 0.35 of a cent at 104.90 cents US after touching a high of 105.29 cents US, its loftiest level since November 2007. Some economists said the rally was powered by a move into commodities as investors sought tangible, safe haven investments. The markets have reacted to concerns about possible inflation as the U.S. Federal Reserve expands the money supply by $600 billion and about the effects on the recovery as that stimulus comes to an end this summer. Traders are also worried about the possibility of a downgrade of U.S. government debt after ratings agency Standard and Poor's warned Monday of a one-in-three chance it would lower the rating within the next two years. "This is a U.S. dollar story as the combination of loose monetary policy and a compromised fiscal position weigh heavily against the [greenback]," said Scotia Capital chief currency strategist Camilla Sutton. The weaker greenback helped push oil prices above $111 US a barrel. Oil also rose after a report showed U.S. gasoline supplies fell for a second week, suggesting higher fuel costs haven't yet curbed demand. June crude oil closed with a gain of $3.17, or 2.9 per cent, to $111.45 a barrel. In Toronto, the S&P/TSX composite index finished the day up 160.65 points, or 1.2 per cent, at 13,897.48, boosted by strong materials and oil issues. In New York, the Dow Jones industrial average climbed 186.79 points or 1.5 per cent, to 12,453.54, its highest level since June 2008. The dollar's advance followed a run-up of more than 8/10ths of a cent Tuesday after higher inflation figures further persuaded traders the Bank of Canada would move to hike interest rates in July. Statistics Canada said Tuesday the country's inflation rate rose to 3.3 per cent in the 12 months ended in March, its highest since before the recession. Economists polled by Bloomberg had been expecting the figure to come in closer to 2.8 per cent. Metal prices also factored into the Canadian dollar's rise. Gold rose above $1,500 US an ounce on Wednesday for the first time as worries over the health of the U.S. economy sent investors flocking for a safe haven. Gold futures for June delivery eventually settled up $3.80 an ounce to $1,498.90. In its warning, Standard & Poor's cited a "material risk" that politicians would fail to agree on how to cut the budget deficit over the medium term, saying the U.S. has "very large budget deficits and rising government indebtedness, and the path to addressing these is not clear to us". This issue could continue to affect the U.S. greenback, Sutton said. "The U.S. dollar should weaken further as the combination of U.S. monetary and fiscal policy weighs heavily on the outlook," she said.